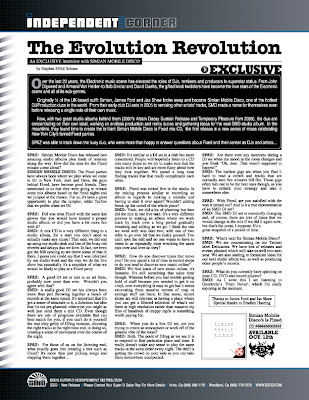 Discussions Magazine Music Blog: An EXCLUSIVE interview with SIMIAN MOBILE DISCO! 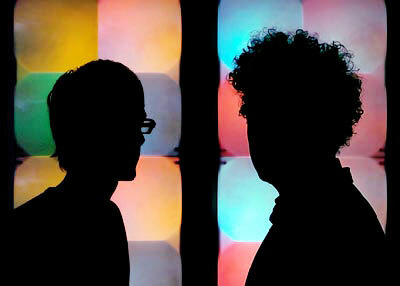 An EXCLUSIVE interview with SIMIAN MOBILE DISCO! Over the last 20 years, the Electronic music scene has elevated the roles of DJs, remixers and producers to superstar status. From John Digweed and Armand Van Helden to Bob Sinclar and David Guetta, the gifted knob twiddlers have become the true stars of the Electronic scene and all of its sub-genres. Originally ½ of the UK-based outfit Simian, James Ford and Jas Shaw broke away and became Simian Mobile Disco, one of the hottest DJ/Production duos in the world. From their early club DJ sets in 2005 to remixing other artists’ tracks, SMD made a name for themselves even before releasing a single note of their own music. Now, with two great studio albums behind them (2007’s Attack Decay Sustain Release and Temporary Pleasure from 2009), the duo are concentrating on their own label, working on endless production and remix duties and gathering ideas for the next SMD studio album. In the meantime, they found time to create the brilliant Simian Mobile Disco Is Fixed mix CD, the first release in a new series of mixes celebrating New York City’s famed Fixed parties. SPAZ: Simian Mobile Disco has released two amazing studio albums plus loads of remixes along the way. How did the idea for the Fixed release come about? SIMIAN MOBILE DISCO: The Fixed parties have always been where we play when we come to DJ in New York. Josh and Dave, the guys behind Fixed, have become good friends. They mentioned to us that they were going to release some mix albums based on the Fixed nights and we jumped at the chance. For us, it's been a great opportunity to play the lumpier, odder Techno that we prefer when we DJ. SPAZ: Did you treat Fixed with the same kid gloves that you would have treated a proper studio album. or did you have a bit more fun with it? SMD: A mix CD is a very different thing to a studio album, for a start you don’t need to actually make any music! That said, we did end up using our studio desk and lots of the hissy old reverbs and delays that we love. In fact, we even got the 808 syncing so we threw some of that in there. I guess you could say that it was informed by our studio work and the way we do the live show but essentially it's a snapshot of what we would be likely to play at a Fixed party. SPAZ: A good DJ set or mix is an art form, probably now more than ever. Wouldn't you agree with that? SMD: A really good DJ set has always been more than just throwing together a bunch of records at the same speed. It's important that it's got a sense of structure to it, a direction but also that it's not pre-planned; otherwise you might as well just send them a mix CD. Even though there are lots of programs available that can beat-match for you, if you can't do it yourself the real nitty gritty of DJing remains, choosing the right tracks at the right time and, in doing so, creating a sense of movement over the course of the night. SMD: It's similar to a DJ set in a club but more considered. People will hopefully listen to a CD mix many times so we try to make sure that the tracks mix in key and are more fussy about how they lock together. We spend a long time finding tracks that that really compliment each other. SPAZ: Fixed was mixed live in the studio. Is the mixing process similar to recording an album in regards to making a mistake and having to start it over again? Wouldn't editing break up the mood of the whole piece? SMD: Yeah, we did a lot of planning but then did the mix in one live take. It's a very different process to making an album where we work track by track over a long period gradually tweaking and editing as we go. I think the one we went with was take two, with one of two edits to go over bit that we really goosed. You can't spot the edit and no one wants to have to listen to us repeatedly train wrecking the same mix over and over do they? SPAZ: How do you discover tunes that move you? Do you spend a lot of time in record shops or do you tend to discover new music online? SMD: We find loads of new music online, it's fantastic. It's still something that takes time though. Whereas before you had trouble getting hold of stuff because you needed to get it on vinyl, now everything is easy to get but it needs excavating from massive torrent of crap or average stuff out there. In that sense, record shops are still relevant as having a place where you can get a filtered selection of what's out there at high resolution rather than massive zip files of hundreds of crappy mp3s is something worth paying for. SPAZ: When you do a live DJ set, are you trying to create an atmosphere or work off of the general vibe of the room? SMD: Both. The point of DJing as we see it is to respond to that particular place and time. It really doesn't make any sense to play the same tracks in the same order every night. The thrill is getting the crowd on your side so you can take them somewhere unexpected. SPAZ: Are there ever any moments during a DJ set when the mood in the room changes and you think "Oh, dear. That wasn't supposed to happen!" SMD: The hardest gigs are when you find it hard to read a crowd and tracks that are normally sure fire winners fall flat. Those gigs often turn out to be the best ones though, as you have to rethink your strategy and take it somewhere else. SPAZ: With Fixed, are you satisfied with the way it turned out? And is it a true representation of an SMD DJ set? SMD: The SMD DJ set is constantly changing and, of course, there are lots of tunes that we would change in the mix if we did it again now, but that's the point, I suppose. It's a great snapshot of a period of time. SPAZ: What's next for Simian Mobile Disco? SMD: We are concentrating on our Techno label Delicacies. We have lots of releases and events planned which will take us well into next year. We are also starting to formulate ideas for our next studio album too, as well as producing other people’s records. SMD: As I write this I am listening to Oneohtrix’s ‘Point Never’, which I'm really enjoying at the moment.